If you were to walk . 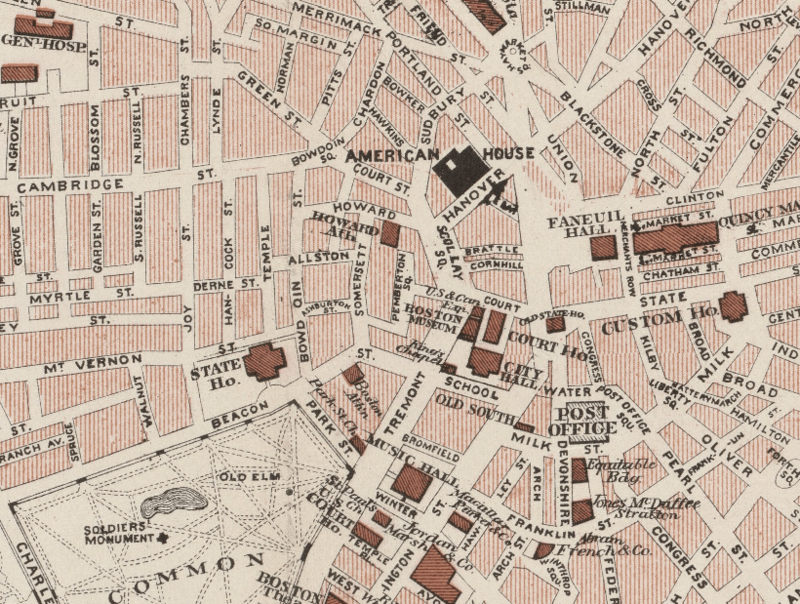 . . through Boston’s Scollay Square and down Tremont Street, into what those alive in 1895 called “the congested district”, you would feel the crush of people and electric car traffic on what, even then, was considered a narrow road. On this midsummer workday, as you walk southwest through the Square (in an area that now borders the rather bereft expanse known as Government Center), you see that the Square is actually a triangle, and oddly shaped at that, that makes the old-timers reminisce about the now-demolished Scollay building, whose footprint caused the irregular shape. You escape the old men by pretending to study the statue of Governor John Winthrop, an early governor of the Massachusetts Bay Colony. The statue is easy to study – since it dominates the Square. Winthrop is depicted in bronze and granite, newly arrived in the New World, holding the colony charter in his right hand; his left hand holds a Bible. Behind him, the stump of a freshly felled tree stands, rope attached – presumably to the boat that had just brought him ashore. It works; you’ve escaped the old men, no small feat in an age when sidewalks were uneven and clothes were constricting. Their stories of the Scollay Square of yore fade into the hum of the traffic. You pass by the statue, and onto the top of Tremont Street. You pass by the Hemenway Building (tallest building, at left), at the intersection with Court Street. It marks the site of a house that once lodged George Washington during his stay in Boston in 1789. You pass other pedestrians, both afoot and aboard the electric cars. Most are returning from work; some visit the area’s many banks, shops, theaters, newspaper offices, or railway stations. As you brush shoulders with these other poor souls battling the foot and street traffic, you catch some rushed words about how grand the new subway will be, how it will push this mess of an electric car system underground, and ultimately how it will make both travel by street and by rail more efficient and reliable. With Scollay Square at your back, the sidewalks of Tremont Street lead you past the Boston Museum at 28 Tremont, between the intersections with School and Court streets. You step inside to escape the crush of humanity on the street and see the statues, paintings, even coins – standard fare for a museum, maybe, but you also hear that the Museum is Boston’s oldest theatre – dating to 1841. One of the most prominent playhouses in the city, its fame these days lies in the introduction of foreign plays premiering in the US, including English comedies. 1,500 people can be seated inside. The best seats will set you back $1 – some seats can be found for 50 cents or even less. You next walk past the Massachusetts Historical Society, housed at 30 Tremont. It’s likely open; its normal hours of operation are 9 A.M. to 5 P.M.. And, an added bonus, the admission is free. Inside, such wonders await as an oak chair brought over on the Mayflower, a vial of tea purported to have been thrown into Boston Harbor during the Boston Tea Party, and even the sword of Miles Standish himself. Its library, said to contain almost 40,000 books and over twice as many pamphlets, contains, within its collection, the largest trove of literature related to the Civil War anywhere. Continuing along Tremont, you next approach the Granary Burying Ground, but you struggle to see the graves over the tops of the electric cars. Established in 1660, the burial ground was originally part of the Boston Common, separated some time later by the construction of the town granary, which stood on the present-day site of the Park Street church. If you manage to cross Tremont, to stand beneath the Burying Ground’s shady canopy, you’ll be able to make out some familiar names within its fences. Paul Revere is buried there. As is Peter Faneuil, who donated the market house and hall that now carried his name. You’ll see the most prominent monument with the cemetery, one marking the graves of Benjamin Franklin’s parents. More meandering will reveal the graves of the victims of the Boston Massacre, three signers of the Declaration of Independence, and nine governors of Massachusetts – colonial and post-Revolution. Don’t think you can just walk in through the curve of the high, ivied gateway. All would-be visitors are to apply for admission at No. 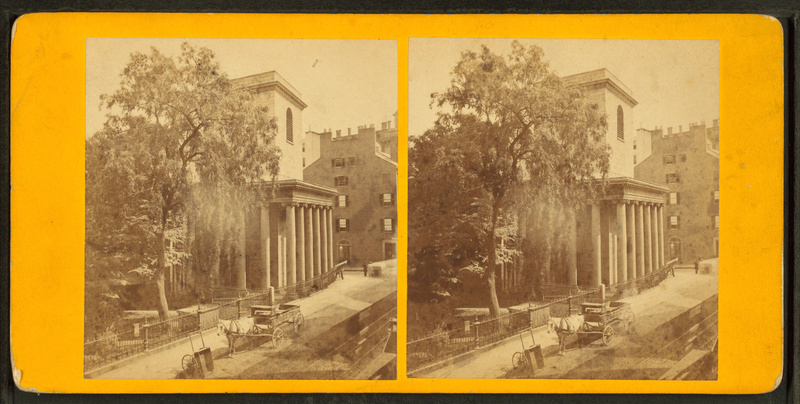 12 Beacon Street, at the office of the superintendent. Beyond the Massachusetts Historical Society building and the Granary Burying Ground, lies the King’s Chapel Burying Ground, and beyond that, King’s Chapel. The Burying Ground, Boston’s oldest cemetery, dates its oldest burials to 1630. A quick wander inside reveals the graves of many of Boston’s earliest prominent citizens. You pause at the grave of Mary Chilton, who, as an eager 13-year-old, leapt from her boat as it approached Plymouth’s now-famous Rock in 1620, thus becoming the first European woman to touch land in Massachusetts. The walls of Boston’s City Hall building (its entrance on School Street) frame the rear of the cemetery. The dark granite wall of King’s Chapel, with its formidable stone tower, forms another boundary of the cemetery. From across Tremont Street, the well-known Houghton & Dutton Department Store casts a long late-afternoon shadow across the graves. Across the School Street intersection, you see the Parker Hotel (now the Omni Parker), first opened in 1855. Inside, a room for the night, “with service and electric light”, can be had for $2, a fairly considerable sum in a day when nightly rates range from 50 cents through $3. The hotel’s “European plan” rates do not include the cost of meals, a concept the hotel was the first to introduce to the US. You next pass by the Tremont Temple, newly built just two years ago, near Tremont’s intersection with School Street. The Temple sees most of its traffic on Sundays, but you might see concerts or lectures there on weeknights in its Lorimer or Parker Halls. If you return on Sunday, you might even catch a sermon by its minister, Dr. Geroge Lorrimer. Past the Park Street Church, Boston Common emerges on the right of the street. Its nearly fifty acres of green grass shaded by mature elms are certainly inviting, calling to you from behind its black iron fence. Your eyes are drawn first to the Brewer Fountain, in place now for nearly 30 years. But, there’s also McDonald’s, across the street at 132 Tremont. McDonald’s, not of the type your 21st-century consciousness might recognize, sits near St. Paul’s Church and is a fashionable women’s clothing store. Its light lunches at midday attract large crowds; some are shopping; some come just to watch the scene unfold. Whether you opt for the merchandise-themed therapies offered by McDonald’s or choose to experience the aesthetic relaxation awaiting you at Boston Common, either is a welcome respite from the congested streets and sidewalks of Tremont Street. You can really make history come alive. I loved this virtual tour, especially since I have ancestors from the Massachusetts Bay Colony. I live in Texas, and haven’t made it up there yet, and I really appreciate your virtual tour. Hi Caroline – thanks for your encouraging words and for the warm welcome! I hope to have a few additional Boston-related posts up soon. Thanks Mary Ellen! I know the route well too. I’ve often walked it during the last decade or so. Reblogged this on Jrlagreca's Blog. This was a great article. Having been raised in Boston I have walked these streets often. My son now works in the financial district. He would like a black and white print or sepia toned print for his office. Where might I find prints such as you used of old Boston for purchase?